Summer of 2010 is waning, Q4 quickly approaching. One season ends as another begins. Here in the US, autumn is a time of new beginnings - schools start up again, the leaves begin to change, the nights get cooler. Football stadiums around the country light up each Friday night, crowds file in, Saturday afternoon and all day Sunday. There is optimism and change in the air; Out with the Old, in with the New. And so it is with MPS - a new season. But unlike the leaves that fall victim to the earthly process, some things in MPS don't want to go naturally. Some processes and beliefs are difficult to crack, like the shell of a walnut or the walls of a once mighty arena. Older icons of a bygone era, deserving nothing less then the wrecking ball. Think about it - this time last year, HP didn't' have any product. This time last year, un-enjoyment was around 9.4%, same date this year, 9.5% - HUH. This time last year, new, MPS training programs hit the street. All that "Change" ain't working. This isn't to say nobody is trying to "work" MPS. From all angles, folks like MWAi and SNi, disti's like Synnex, leasing companies like GA and third party toner guys. And training? Forget about it - throw a rock and you will hit a dozen. Google "Managed Print Services sales Training" and about 278,000 results come back. With all this activity, one would think there would be many more success stories out here - and Xerox or HP Enterprise level, "converted" accounts don't count; neither do SLED accounts. This is what's up: there are plenty of successful Managed Print Services providers out there, today, right now - regardless of how one defines MPS. And they are not seeking or getting "press". One more little secret, these providers are successful not because of some expensive 12 week long, out of date MPS training engagement. Not because of the super-duper software package they've invested in nor is success hinged upon a "unique" relationship with a vendor or distributor. They are successful IN SPITE OF ALL the above. There was a time when spending three days in a selling class meant giving a demo at the end. There was a time when "solution selling" was mostly an option. An approach that looked great on the transparencies and projectors and in 3-ring binders. And yet, great dealerships were constructed back then. Mighty brick and mortar structures. Halls adorned with certification plaques, front rooms teeming with the latest machinery - dozens of machines from half a dozen manufacturers. And they came. Millions of customers. Banks and churches. Cities and schools. Real estate and investment firms. We were ready. 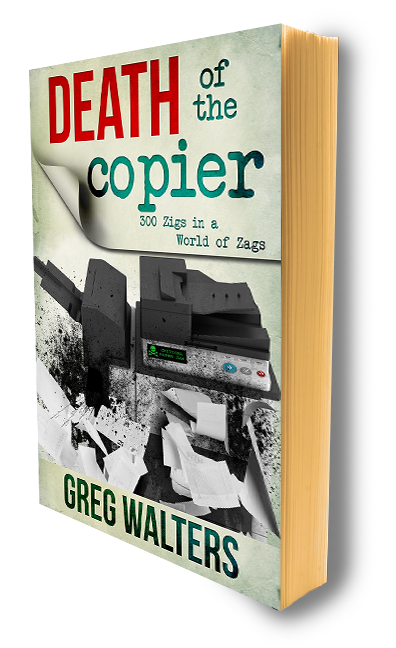 Thousands of copier sales people. Carting fax machines around in the back of Pinto wagons. Dazzling prospects with our demo skills; making our little machines perform tricks like monkeys. For two decades they came. Believing everything we told them. Rated speeds, expected monthly volumes, easy to get out of leases and at the exact, perfect time, we would use the best line of all - "I can get you a bigger, better, faster machine for less than what you're paying today...press hard, you're making 5 copies..."
All this business despite the flexing, rollovers and evergreens. And all that over capacity; over indulgence. So many 11x17 machines - paper trays inhabited by thousands of dust bunnies. All those Brother faxes sitting next to an HP Series III and a Ricoh (with a built in fax board). Empires rose and were sold off - Alco to IKON to Ricoh, Global to Xerox. Minolta,Konica, Danka, Konica. Oce to Canon. Words of steel and lessons in concrete, seemingly impregnable. Houses of champions past, haunted cathedrals of lost faith, magic and superstition. Blood was spilled, arenas filled. That was then, this is now. Time for the wrecking ball. Time to let go of the past, once and for all. The 80's were fun - let it go. The 90's were slick - let it go. Hard times come and hard times go, like the leaves in the fall. It seems today, in MPS, if you got the guts, if you got the balls, it's time to step up to the line, let go those old business models and remember why you got into this crazy industry in the first place - to make something out of nothing. To go boldly. Adventure, fortune and glory. Be skeptical of those who say our future is in our past - step aside and let the wrecking ball of reality shape their world. "...when all this steel and these stories, they drift away to rust and all our youth and beauty, it's been given to the dust...when your best hopes and desires, are scattered through the wind...bring on your wrecking ball..."